To make the pastry, sift the flour into a mixing bowl and make a well. Mix with the butter until you reach a breadcrumb consistency. Add the egg yolk and mix and then add water to form a dough. Wrap in cling film and rest in fridge for half an hour. Roll and then blind bake in a nine-inch tart case at 160c for 40 minutes. To make the filling, gently sauté the squash for 5-8 minutes until soft. Blanch the broccoli for 5 minutes and then refresh. Whisk milk, cream eggs and seasoning. 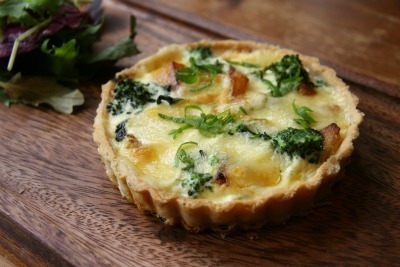 Place the broccoli and squash in the flan, pour over milk and egg mixture and then top with the cubed Saint Giles. Bake at 170C for 35 minutes. Serve with green salad.